Congress candidate for South Mumbai Milind Deora believes that it is important to choose candidates and judge them on their parliamentary performance rather than their party. In a live chat on Twitter conducted by IBNLive and initiated by MTV India’s #RockTheVote campaign, followers were asked to tweet their questions with #TownHall. @sweetyhardi: What inspired you to enter politics? Your father or your own instincts? Congress candidate Deora said Raj Thackeray led MNS is his biggest challenge. @OmPrasaad: What are your thoughts about you being accused of dynasty politics? Milind Deora: In 2004 I got a chance because of my political background but in 2009 I won by a much larger margin which hopefully means something! @PortKeyBearer: What are your thoughts on the increasing inflation in India? @anishgawande: How do you propose to solve the degradation of South Bombay’s heritage buildings? Milind Deora: I have worked with State Government to ensure a robust system in place. We are working on the Bhendi Bazar cluster redevelopment. @jotijadhav: What is the best reform you made in the IT & Telecomm industry? @PhalinShah: MP’s are supposed to serve people. Why do MP’s get special privileges over a common man? Milind Deora: I personally have never used the ‘LaalBathi’ in the last 10 years in Mumbai. @JaysukhBiswas: How can we ensure candidates with non-criminal records and considerable educational qualification? Milind Deora: I fought to keep convicted people away from contesting elections. Many MPs have different education than me, but are also capable. Milind Deora: I think parties need to come together and figure out the difference between nature of criminal allegations. @KishorQPatel: Who is your main opponent this elections? Milind Deora: I do not take anyone lightly, but my main opponent is MNS. @OzarkarVijay: Do you really think MNS is a bigger threat to you than Shiv Sena? @anishgawande: Fundamentally, can we as a nation start voting for parties rather than candidates? Milind Deora: It is important to choose candidates and judge them on their parliamentary performance rather than their party. ‏@PhalinShah: And why don’t ministers/politicians pay toll? Roads are built for everyone, no? Milind Deora: I agree. There should be no 2 rules. I have never used LaalBathi myself in the last 10 years. @PoojaI: Is declaring a PM candidate pre-elections a good step? Milind Deora: It really doesn’t matter in our system of parliamentary democracy; it is more about media spins. @ItsNg100: What are your thoughts on MPs & MLA’s with criminal charges? Milind Deora: My record stands clean. I have spoken against my own party and my government regarding this issue. @LankaHemali: Do you think Meera Sanyal’s corporate experience will help her with Governance? Milind Deora: People from different backgrounds lend different opinions to politics but the record of the bank she works for speaks for itself. @LallKanchan: Bala Nandgoankar, Arvind Sawant are all for Marathi votes, how do you plan to tackle these Marathi votes? Milind Deora: South Mumbai voters know dividing people on the basis of language is a thing of the past. @MalhotraHema: MeeraSanyal recently blamed you, MNS & ShivSena for bad conditions of road? What is your take on this? @ThatAkashShukla: I have myself drifted towards #modi from #congress. Do you think you can earn back similar drifted voters? @MaganKalita: What are the major issues you think are important which none of your opponents are talking about? @naglegourav: Major issues which your next term would specifically highlight in Parliament? @KhujliPowder: A Candidate may be a good & honest person but his Party doesn’t get to Power. What is the fate of his Constituency? @anishgawande: With anti-incumbency going against the Congress at both the Centre and Maha, will this be the toughest election you’ve fought? @NeetaLAhuja: Do you think you can be a good MP even in the opposition in the parliament? @PrateekShri25: How will the students’advisory council in your manifesto help our youth? Milind Deora: Students will be my eyes and ears on the ground and I will be their voice in Parliament. @ChintanMittal: You are always been accessible online, how accessible are you offline? @RiddhimanRang: Direct Mayor is a need of the day in Mumbai. How can you accelerate this? Milind Deora: We can accelerate this making this a political support. Need more people supporting us. @sachinm851: Modi is creating dreams & AAP doing what is right for our country. What are your views? Milind Deora: My ministry is conducting the first country specific study on impact of mobile tower radiation on humans & other species. Post study, we must revisit the norms and ensure that limits are safe for all. @SrivastavSruti: How will you be augmenting train capacity under MUTP to help Mumbai better? ‏@SuneelParmekar: What can be done for better implementation education right for people BPL? @LankaHemali: Can Indian economy afford Trans Harbour Sea Link – given in your manifesto? Milind Deora: With Navi Mumbai Airport underway and its impact on traffic, I hope it becomes financially viable. I’ll continue to push for it. @MaganKalita: Don’t you think we need to increase our CCTV surveillance on the roads? Milind Deora: Yes. The Police is doing it. I have also used my MP funds locally as well for it. @jiganeshdeol: How is it that you speak Marathi so well? 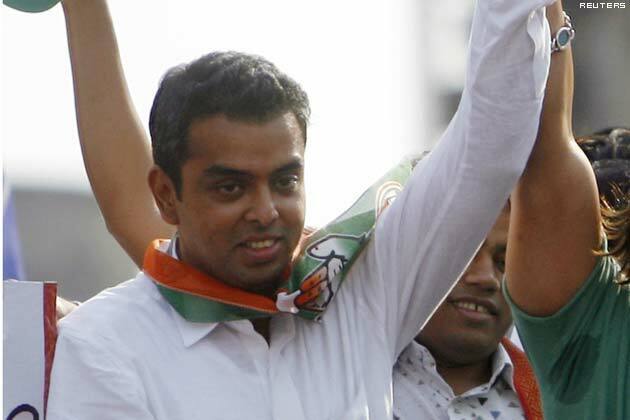 Milind Deora: My mother tongue is Marathi and I have been born and raised in Mumbai!